Strawberries. Just the word, strawberries, it sounds quintessentially, summer. And they taste so good, whether freshly picked and eaten next to your patch or turned into homemade strawberry ice cream. What's more, strawberries are easy to grow, and this makes them a great Spoonie Veg. Although the fruit of strawberries are a soft, they are an extremely hardy plant and can survive prolonged periods of freezing temperatures, such as what we had in 2010-11. They are perennials, and in mild winters will retain much of their foliage. Whilst they like a sunny spot, I have grown them successfully in part shade, underneath pear trees and among ornamental plants. 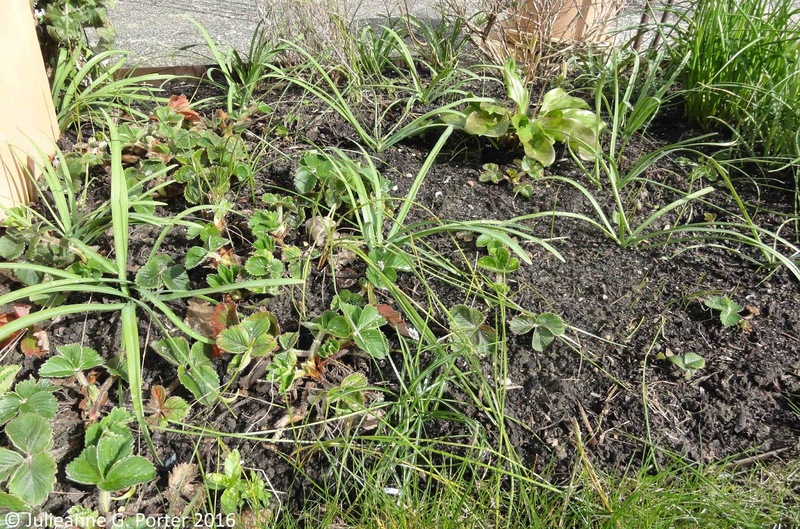 Even a small patch of strawberries, such as mine in the above photo (under 1 square metre), can supply you with a decent harvest. 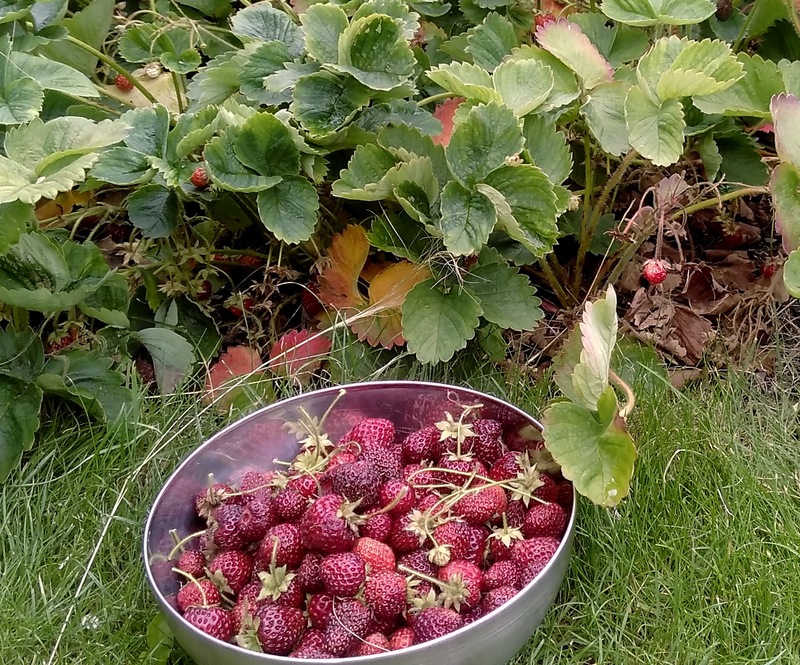 This year my small patch was only in half-production (more on that shortly) and I still was able to serve strawberries for dessert for 18 people over the space of a few weeks. Given how little effort it takes to grow strawberries, that's a pretty good yield for a small patch. I've also found that as long as you give your strawberries a feed early spring (spread some well-composted manure under them), that they will even grow in heavy acid clay. So they aren't too picky about soil, just as long as you feed them (manure) and water them as the fruits are developing. In fact, from a spoonie perspective, most of your spoons will be spent on these tasks, and picking them to eat. Much of the year you just leave them to do their thing. The one more spoon-intensive issue you have with strawberries, is that the plants are only really productive for 3 or so years and best in the 2nd and 3rd years. After that the quality and vigour of the fruit declines, so you need to replace the old plants with new ones. The easiest spoonie way to do this is just to buy and plant new strawberries. But if you have some energy in late summer, potting up runners is the free way of getting new plants. After fruiting, strawberries send out runners, what looks like long stem shoots. These have notches upon them that over time develop into new strawberry plants, and if they are near the soil, they will root and start growing there. Which is good if it's in the right place, but if not, you can pot up these runners too. I do this by putting some compost in a small pot, then pushing the base of the newly developing plant into the compost. I hold down one end of the runners with a stone, to encourage it to stay in the compost and not have a light breeze put it out. By mid-Autumn you can cut the runner off from the main plant and either plant it out, or wait until Spring. If the latter, just put them in a place where they will get some sun and if it's a dry winter, water them occasionally so they don't die off. This was the 3rd year my patch was in production. Last autumn I took some runners and then in Spring I planted them. As the new plants wouldn't produce that much in the way of fruit, I dug up half of the patch and after adding manure, I put in the new plants. You can see below my patch in half-production, with those on the left being the older plants and those on the right the young plants taken from runners last year. 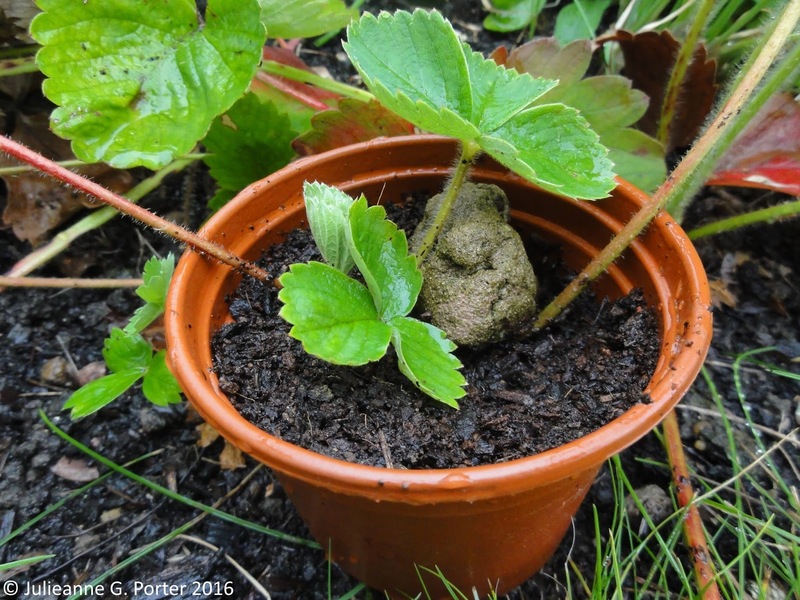 You certainly can grow strawberries in containers. You still need to give them a top up of manure in the Spring, but the main spoonie issue, as with any container growing, is that in dry periods you will have to spend more energy watering them (possibly daily) compared to those in the ground. Some of you may have come across 'strawberry towers', which give you the ability to grow vertically. This is great, in theory, but my experience with growing in strawberry towers rather put me off doing this again. Because, quelle surprise, those at the top dry out quicker than those at the bottom. So in dry periods you have to water them in the morning and the evening, and in wet periods those that the bottom can rot. From a spoonie perspective, I'd avoid growing this way unless you are willing to allocate spoons regularly to this task and don't mind micro-managing the watering. When it comes to pests, the main problem you will have is the birds wanting to eat the strawberries just as they are ready. Blackbirds, in particular, seem to know the exact moment fruit is ready to eat. Throw some mesh over the patch for the few weeks of fruiting prevent the birds from getting at them, though of course that means slightly more energy is needed for lifting it up then putting it back down when picking. For some reason I don't have that much problem with the birds going for my strawberries, so I've only had to net them twice in the last 10 years. So it might not happen, but it's worth keeping some mesh on standby during fruiting season. 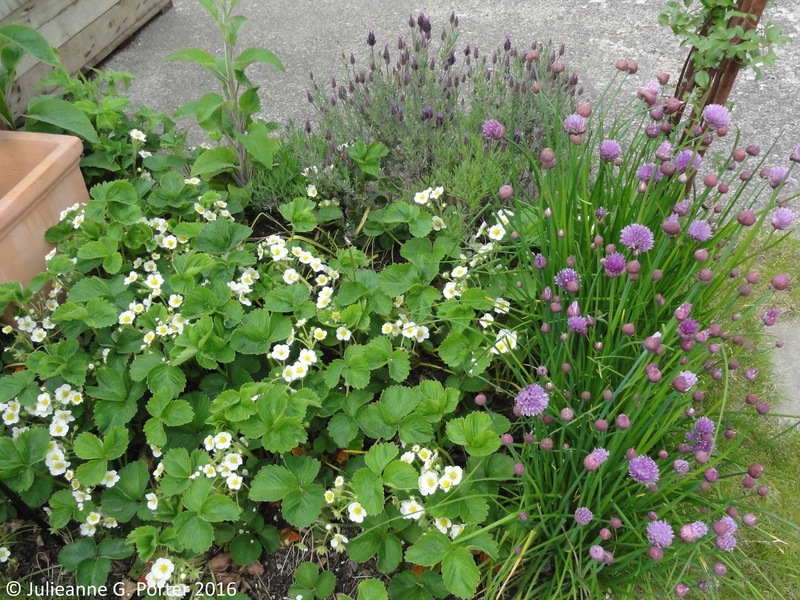 As mentioned earlier, I have also grown strawberries with ornamental plants. 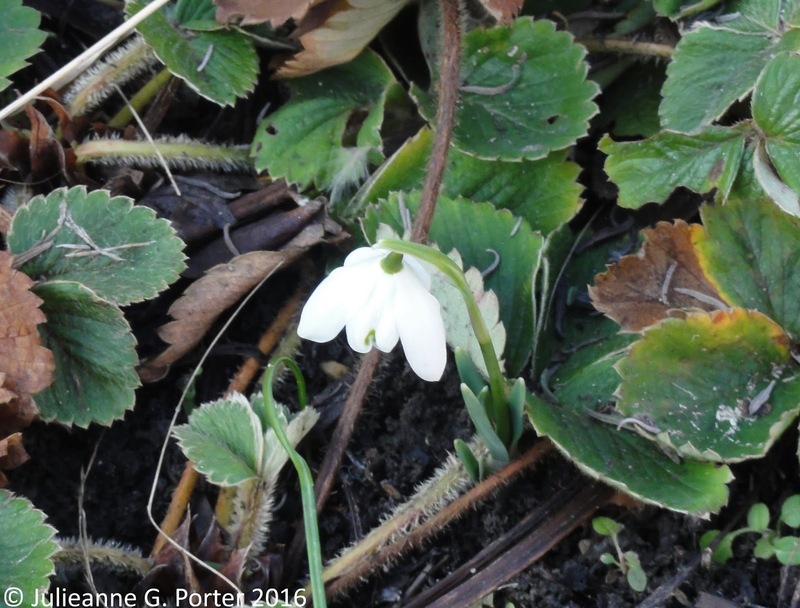 My current patch has snowdrops coming up amongst the strawberry plants in February, is intermingled with a small erythronium patch in April, and is bordered by chives. The other benefit of growing ornamentals with your strawberries, is that it extends the season of interest for that patch of the garden. This is particularly useful in your home garden where how the garden looks might be more important, than at an allotment. Pick them and eat them. Well that was easy. 1/2 a spoon? Ok, you might like to have them with ice cream. Ok, I like to have them with ice cream. So that means picking them, hulling them (removing green leafy top), throwing them into a bowl and adding the ice cream. Also very easy, say 1 spoon. In my better ME periods during strawberry fruiting season, I've also made my own strawberry ice cream. This is a nice way of extending your season, and it's always a delight in winter to open up the freezer and come across some homemade strawberry ice cream. 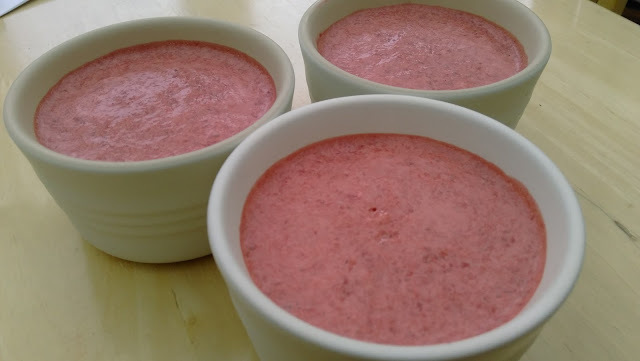 I use a simple French Glace aux Fraises recipe that doesn't require an ice cream maker. Making this requires more spoons of course, so the great thing about strawberries is that just strawberries and with shop-bought ice cream is still a wonderful treat for minimum effort. Strawberries are a spoon-light fruit to grow, and provide a great treat for a few weeks over summer. They earn their place in my small garden. How about yours? In my post introducing Spoonie Veg, I gave Strawberries a rating of 1. That being: 1-2 requires few spoons, 3-4 moderate spoons, and 5 hard, lots of spoons needed in order to grow that fruit, veg or herb. Spoonie Veg posts are limited to my experience of what I grow, so it is great to hear from you if your experience is different. I welcome your thoughts and comments. And if you blog about gardening with ME/a chronic illness, or are just interested in gardening in general, I'd love to hear from you on your growing experiences. To some degree I'm limited by what I do or don't grow. And having no knowledge of growing blueberries & raspberries, I don't feel I can write about them. But if you feel like writing a guest post on why blueberries & raspberries are even easier to grow, please do! Oddly enough I don't have that much of a problem with other creatures going for my strawberries. Last year was the only time the Blackbirds had a go at them, who were thwarted when I put down some mesh. But this year they didn't come near them. I should, and will, add a comment about pests and netting. I wish I like raspberries more as they do sound easy to grow. Though can't they take over if you don't managed them? Do they have any problems with pests, such as the birds eating them? I was just looking back at this conversation and realised I never replied. Sorry! We're lucky in that the birds don't seem to go for much in our garden. Too many cats around, I think. And no other pests seem to bother the raspberries. Yep, most raspberries do like to spread, but there are some new varieties coming out which can be grown in containers, or you could plant them out in that material which helps to contain plants like bamboo. I'd say autumn raspberries are about the same effort as strawberries, but with the potential to crop over a longer period. Summer raspberries are slightly more effort as you need to support the canes. Whichever you choose, I can't think of a better reward for your spoons (in both senses of the word!) than a freshly picked strawberry or raspberry. That's useful to know about Autumn Raspberries. I'm thinking of trying some out to see what I think. I do like raspberry (and apple) juice, so I think I should challenge myself to eating fresh raspberries. You have all convinced me! I do love your Spoonie veg posts :) And you're right - strawberry towers are tricky to manage! Someone needs to design one with watering inlets at strategic points down the tower. Thank you Emma :D Good idea about the strawberry towers. Maybe now that vertical growing is becoming more fashionable, this might be addressed soon.